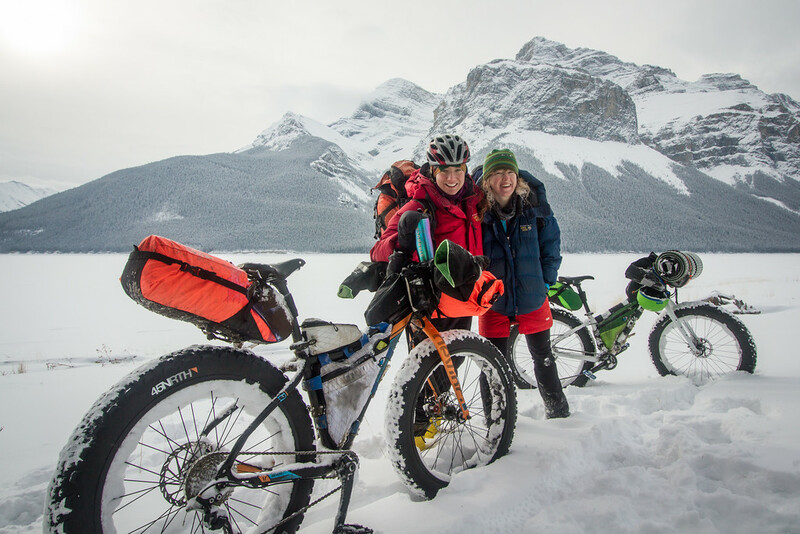 Last October I attended (and presented at) the Canmore Bikepack Summit – which I still need to write about, but that’s another story. 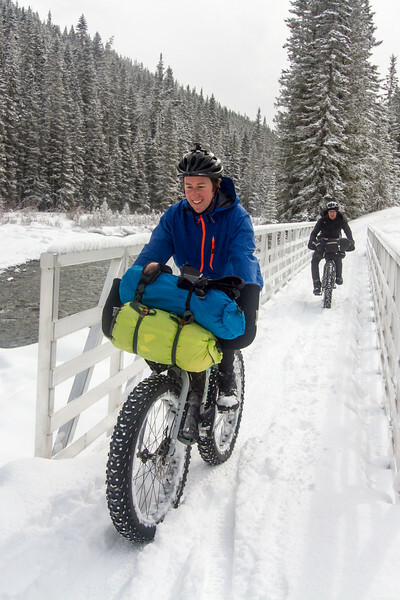 But that led to meeting a lot of very awesome folks who were keen to get out bikepacking, and to me volunteering to host a couple of local Bikepack.ca overnighters, throwing the invite open to whoever wanted to come. 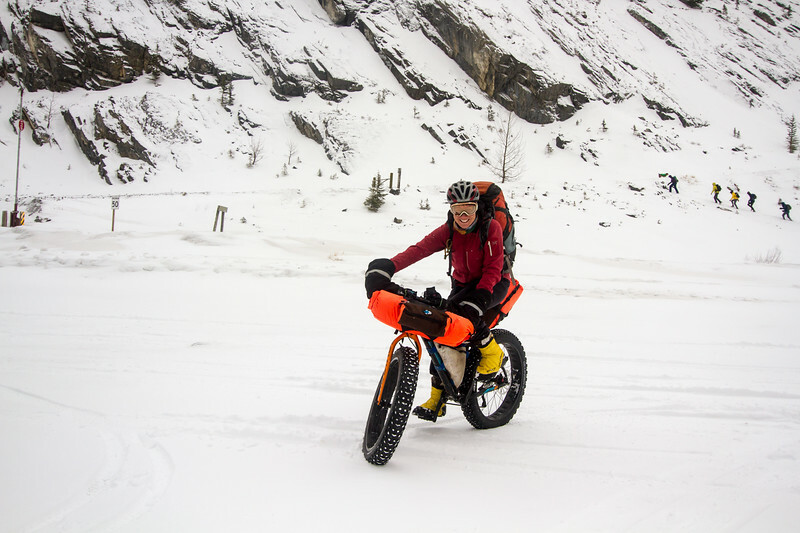 And that is how I came to be preparing to go bikepacking when there was a snowfall warning, threats of 20cm or more of snow, and a likely overnight temperature in the vicinity of -20oC. Despite the weather forecast, it looked like the five others who’d registered an interest were still keen. 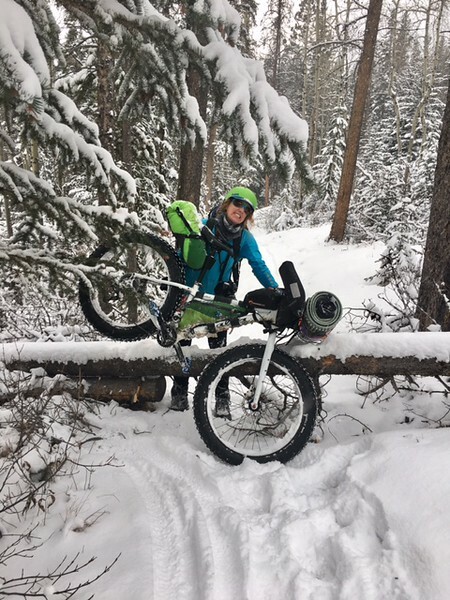 We kicked around the idea of shortening the ride, camping somewhere else, but in the end, decided to just go ahead with it. 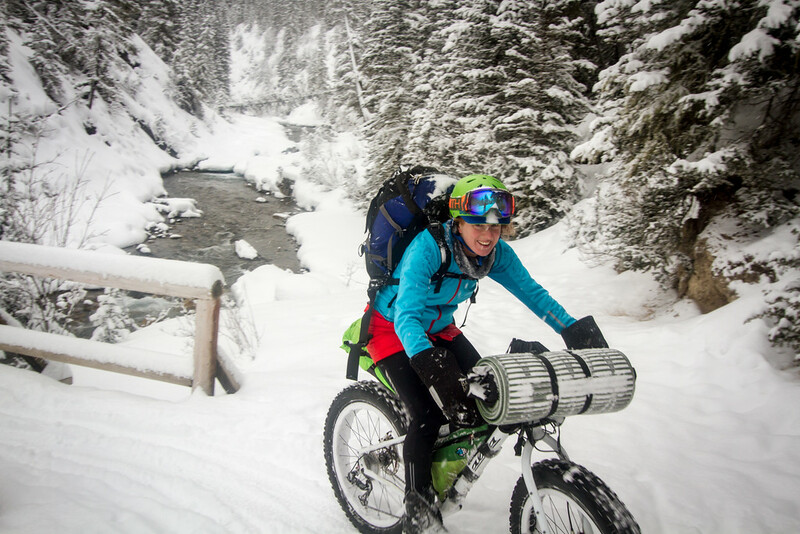 On Saturday morning Kat and I accepted the very kind offer from Guy for a lift up to the Goat Creek trailhead. Lazy? Yes. Cheating? Sure. But we’d both been feeling a bit like we were coming down with colds, it was very snowy, and the road up the pass can be very busy on a Saturday morning. That’s our story and we’re sticking with it. 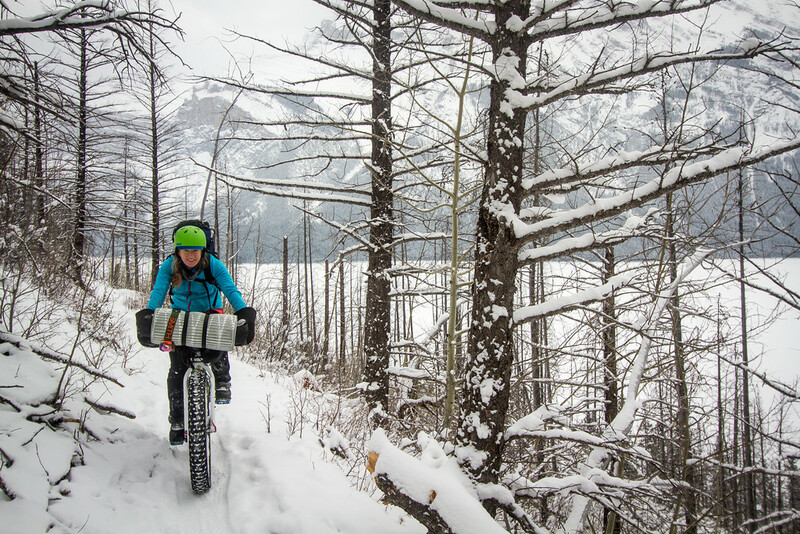 This was Kat’s second time on a fatbike – but what better way to learn how to ride one? And so Team Canmore set off at around 10.15am from the Goat Creek trailhead. We’d meet the Banff guys up ahead, and Dean was going to be chasing after us from downtown Canmore (after finishing his second breakfast). There was quite a bit of snow, and it just kept coming down! 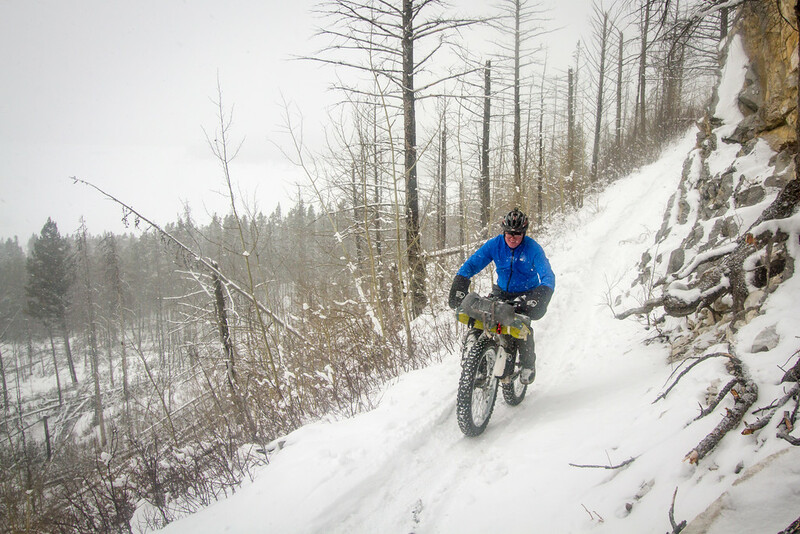 It was pretty light and fluffy though, and although riding conditions weren’t fast, they were still pretty good. At one point, miracle of miracles, it even stopped snowing! And there was blue sky! This wasn’t to last though. Likewise, the freshly groomed perfect corduroy also only lasted a few kilometres. We definitely enjoyed it while it lasted though! 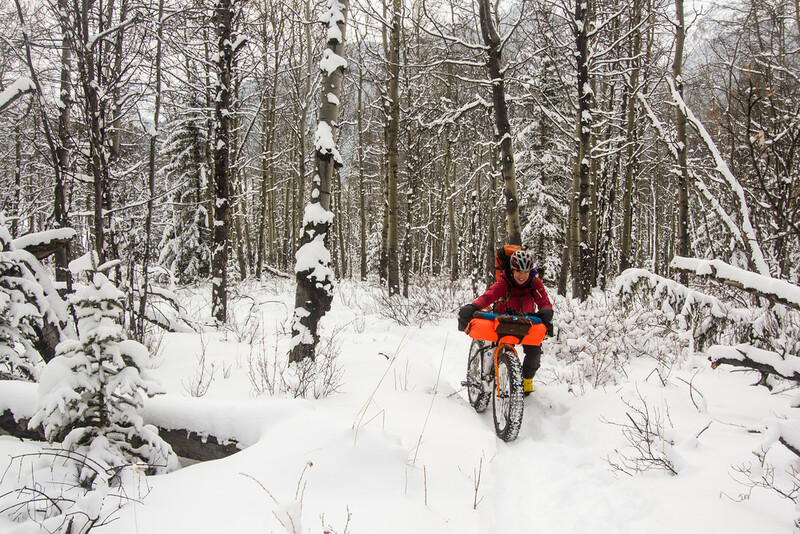 We found Neil while out pedalling the fresh corduroy, and headed on together on the east side of the Spray River. And then we were five! 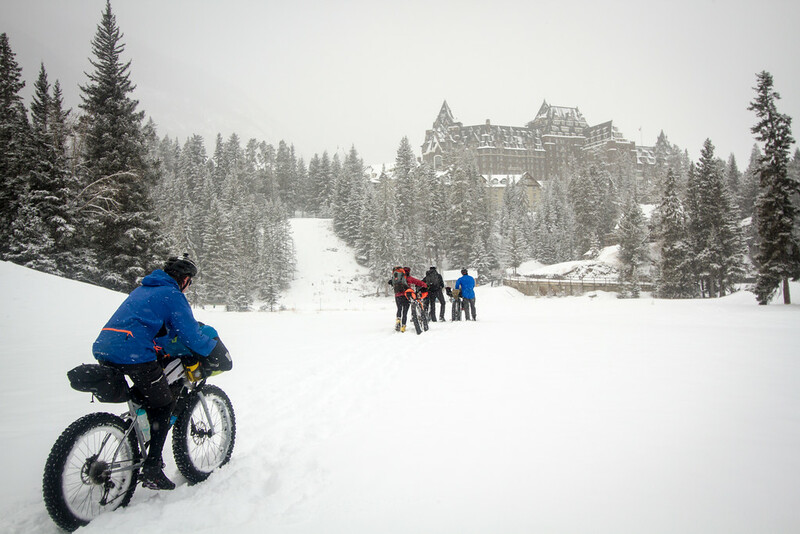 Rounding up Jeff not too long before getting to Banff Springs Hotel. Well, not that we actually went up there. We cut across below, past Bow Falls and then over the new(ish) pedestrian bridge and into town. And to Wild Flour Bakery! I swear I need to get a sponsorship from this place. It’s amazing. We refuelled, warmed up, and waited for Dean. 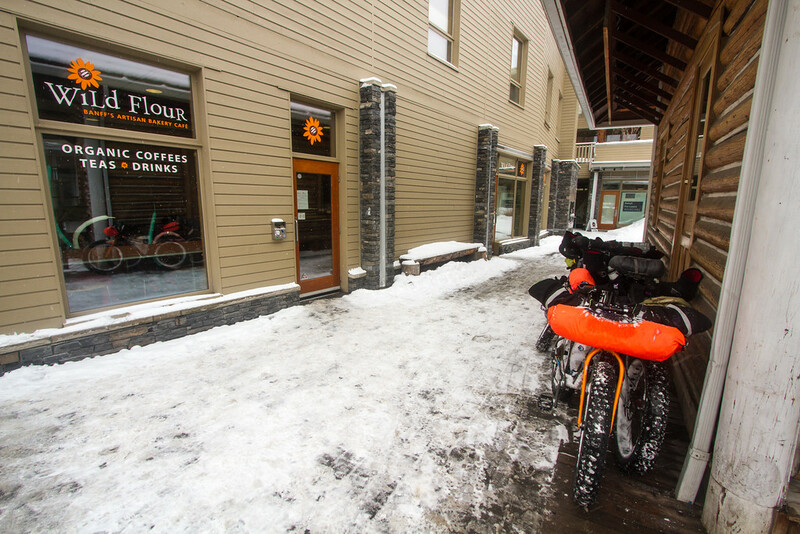 Then wandered down to the bike store, browsed, then returned to Wild Flour for our second visit, this time with Dean. There were six of us then, and we were ready to roll! 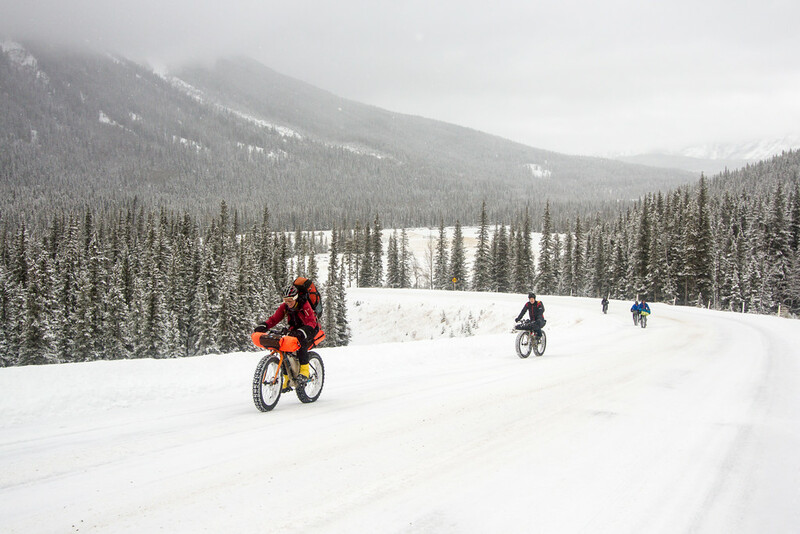 Biking out of Banff towards Lake Minnewanka, the stretch with all the traffic isn’t the most fun, especially when the shoulders are coated in slushy snow. 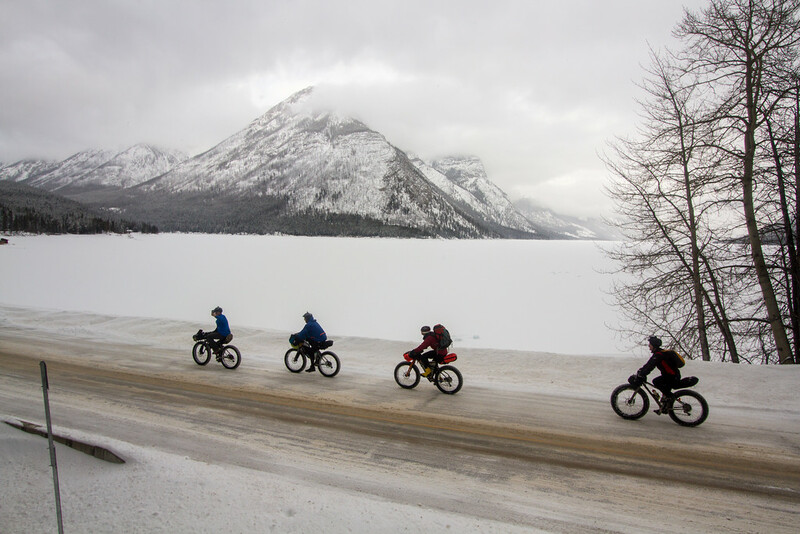 But before long we were onto the Minnewanka road, the traffic died down, and riding conditions improved. I was even feeling pretty good about the speed we were moving along at, until a runner starting overtaking us. It was just on the uphills though. Mostly. But finally, we’d made it! We were at Lake Minnewanka, with over two hours until sunset up our sleeves. (And I clambered up a snowy bank to take the below photo, post-holing through snow up to my thighs, and narrowly avoiding slipping to my doom). 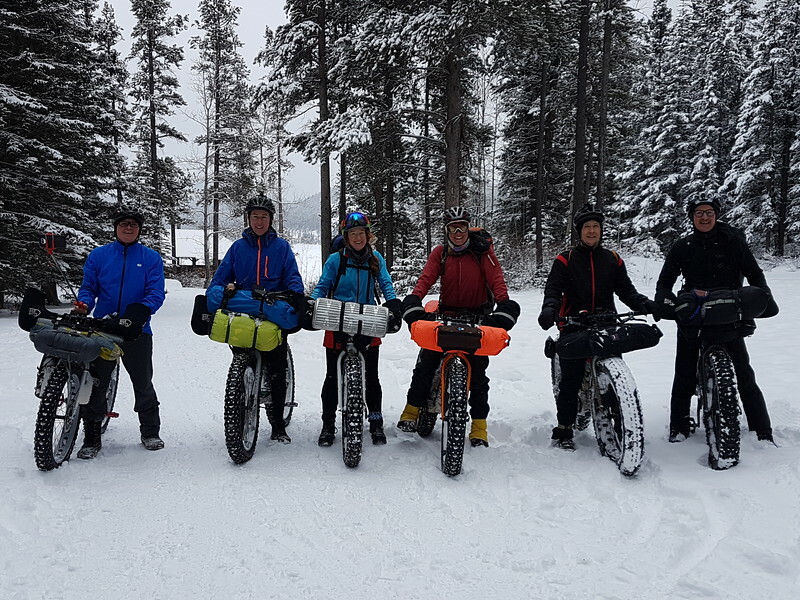 The good thing about being overtaken by a runner, is that you can then accost him and demand request politely that he take a group photo of the bunch of mad fatbikepackers. Thanks to some very lovely snowshoers (we didn’t actually meet them, but they could have done their own grandmother in for the life insurance and I’d still think they were lovely, snowshoers do such a wonderful job of packing down trails)… but as I was saying, thanks to some very lovely snowshoers, we had nicely packed trail to ride for the first few kilometres. Although things got a little wobbly on the descent down to the lake. Well, I wasn’t paying attention, pedal struck on a rock and fell down the hill a bit. Snow is wonderfully soft though. Although whatever banged my knee? Not so soft. Still, it was mostly lovely riding through the forest after that, getting gradually less travelled the further along we rode. 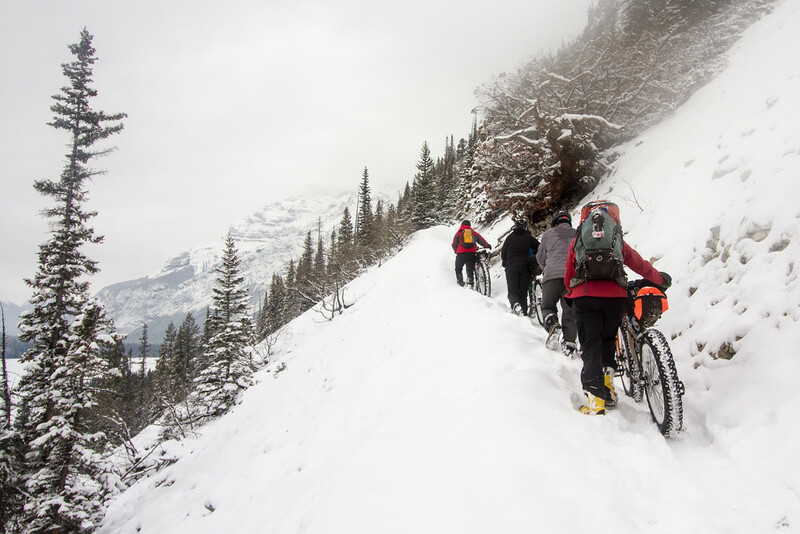 The last few kilometres to camp required a lot more concentration to stay balanced on that thin white line, and we were leaving bootprints in the loose snow beneath the bottom of our pedal stroke as the pedals spun around. Only a couple of deadfall trees to lift the bikes over, and then, the bridge of peril. After watching Jeff walk his bike across, Dean was considering it dubiously. The bridge never feels terribly solid at the best of times. But in the meantime, Kat happily wandered across the frozen creek below the bridge, and we all followed her lead instead of risking it. 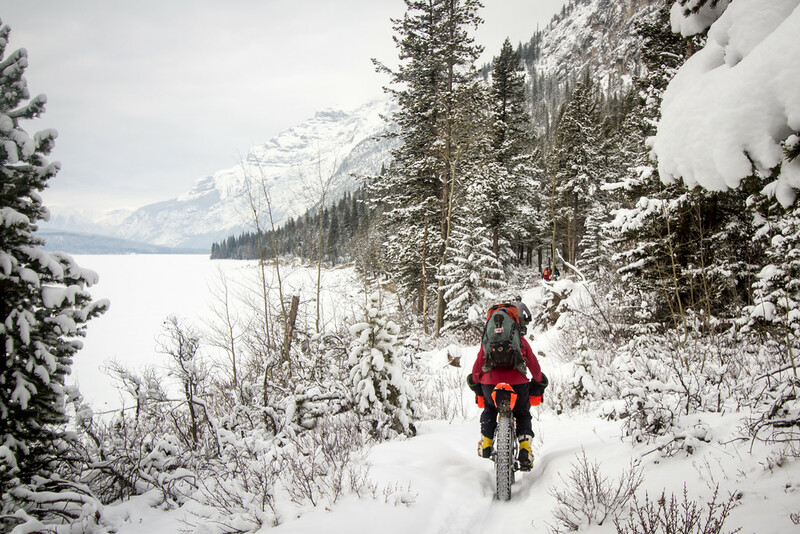 After a final push through deep snow to get down close to the shore, we were clearing tent pads in the forest at the LM8 campground. There was not much more than a few inches of unconsolidated snow there, which was easy to clear. However it was not so easy to drive tent pegs into the frozen ground. And if you could get them in, it was in some cases damn near impossible to pull them out again afterwards! My little Macpac tent finally got it’s first proper outing in snow in Canada, after being accustomed to lots of ridiculous Australian snow adventures. 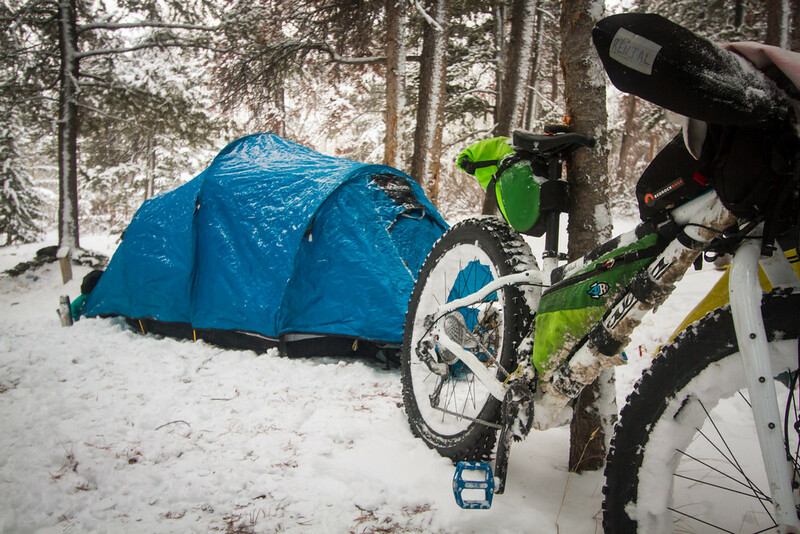 And our little bikepacking village in the snow was finally set up. We then spent what seemed like hours melting snow to rehydrate dinners, make tea, coffee, hot chocolate, and prep water for the following day. There was talk of creating a fire, but we were lazy/perspicacious cavepeople and decided the warmest course of action would be to retreat to our tents. At which point I realised that the patchy cell reception I’d been using entirely disappeared at ground level. After giving up on futile attempts to gain reception by holding my phone to the roof of the tent, I set my phone into airplane mode and settled in for the night. I was in an old Kathmandu Rumdoodle sleeping bag. I’ve no idea what temperature it was supposed to be rated to. I think Kathmandu was always cagey on that kind of thing, and just called it a snow bag. Well it’s enormous, and very warm if not necessarily very light, and it’s stood me in good stead on a lot of snow camping trips. This one was no exception. I had my Thermarest Ridgerest, and Thermarest Neoair, then the Rumdoodle, and a whole pile of layers of clothes on, and one handwarmer clutched in my hands, and I was cozy and warm sharing the tent with Kat. A small window of skin was exposed to the tent air, and I could feel the cold biting at my nose, but the rest of me was snug and warm. And so I laid and read, and then daydreamed, then slept, then listened to a podcast or two, and somehow it was morning, and I’d had a lovely night’s sleep. Hearing the others starting to get up, I reluctantly emerged from my sleeping bag, and started the morning routine and the packing up of camp… after first eating the two bars I’d shoved in my sleeping bag so they’d be nice and warm for breakfast (they were). 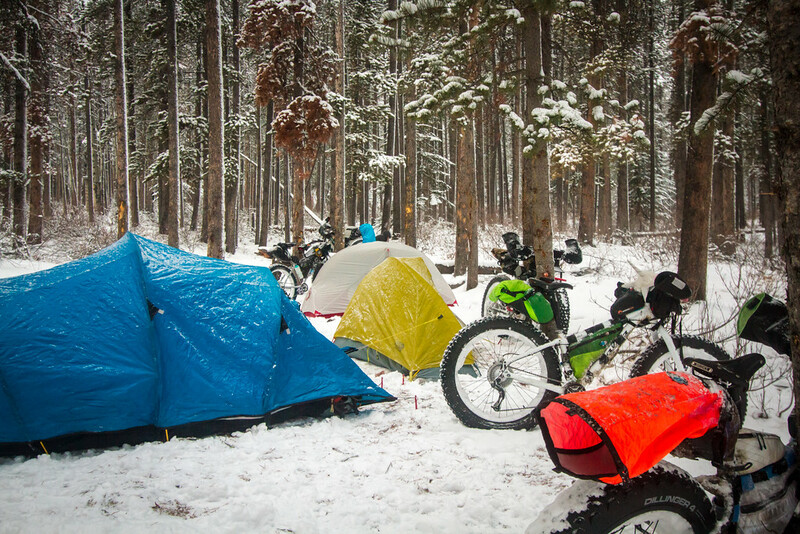 Eventually we’d all had hot drinks, packed up, and somehow convinced frozen tents to reattach themselves to our bikes. It definitely wasn’t a warm morning, around -22oC according to group thermometers. I was glad there was no wind. Even gladder we managed to avoid having any mechanical issues. 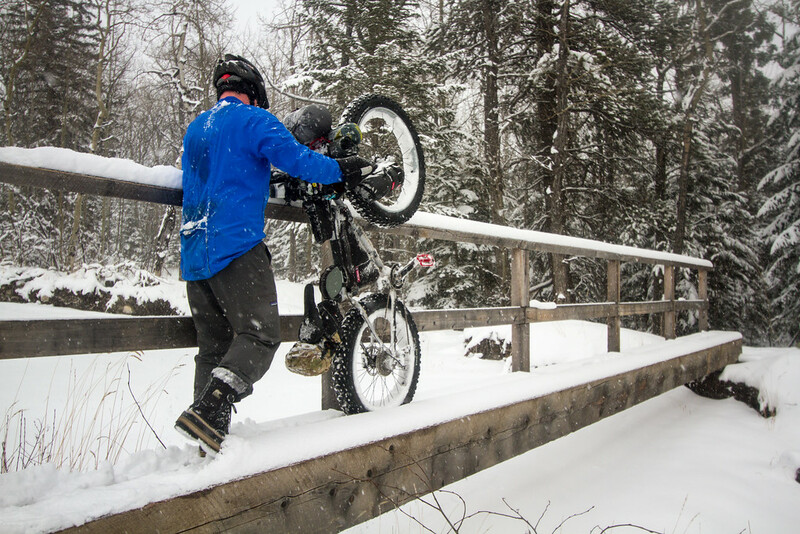 There are few things less fun than having to fix a bike at those temperatures. 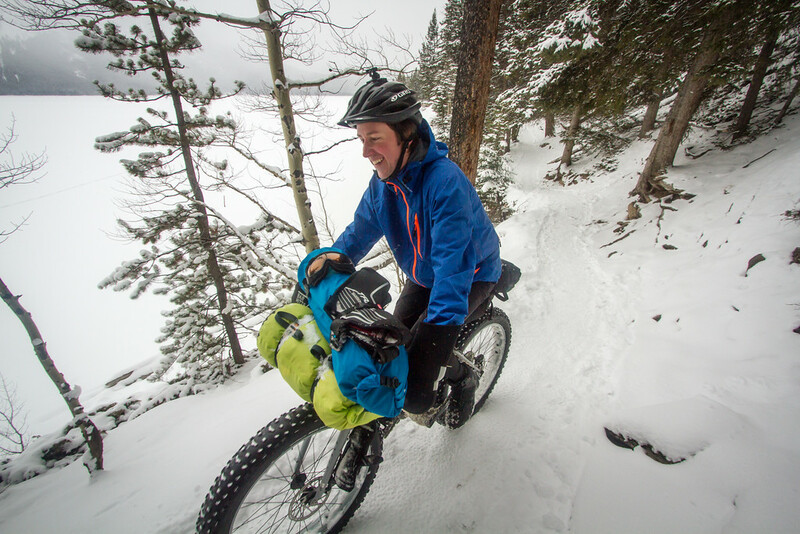 After the initial push up from camp at LM8 to the main trail, we found it was basically rideable most of the way out. 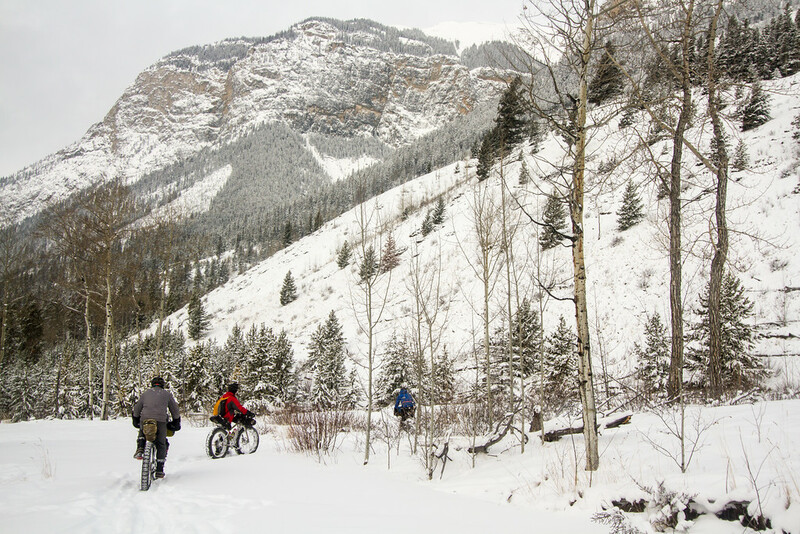 Six idiots had ridden their bikes along the trail yesterday and packed it all down for us. It was a beautiful still morning, and I was actually feeling nice and warm, without even using any hand/toe warmers. 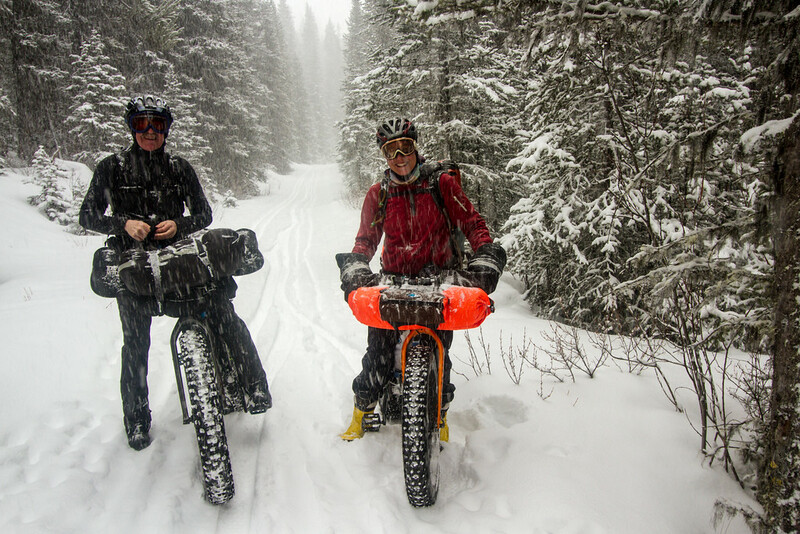 Maybe I’m finally getting the hang of layering for fatbiking? The one part of the ride that of course wasn’t rideable – that final climb up towards the end of the lake. It was very definitely not rideable. Not for us, not that morning. 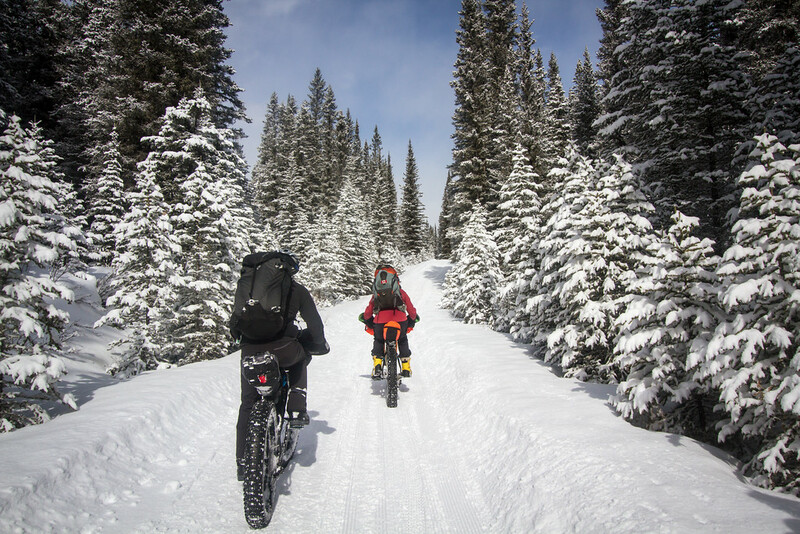 But it wasn’t a very long push, then we were back on our bikes and cruising downhill, flying along and maybe giggling just a little. The ride out was pretty uneventful (thankfully?) 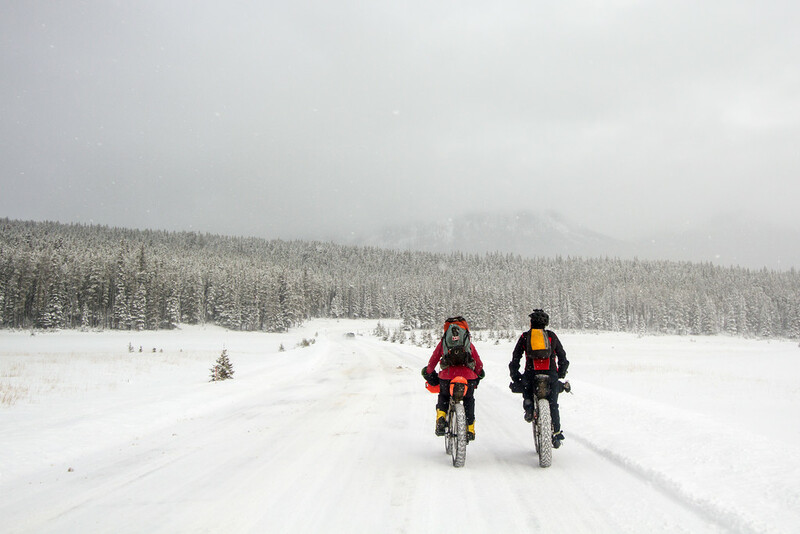 – things went smoothly, no wolves, no mechanicals, no freezing to death. 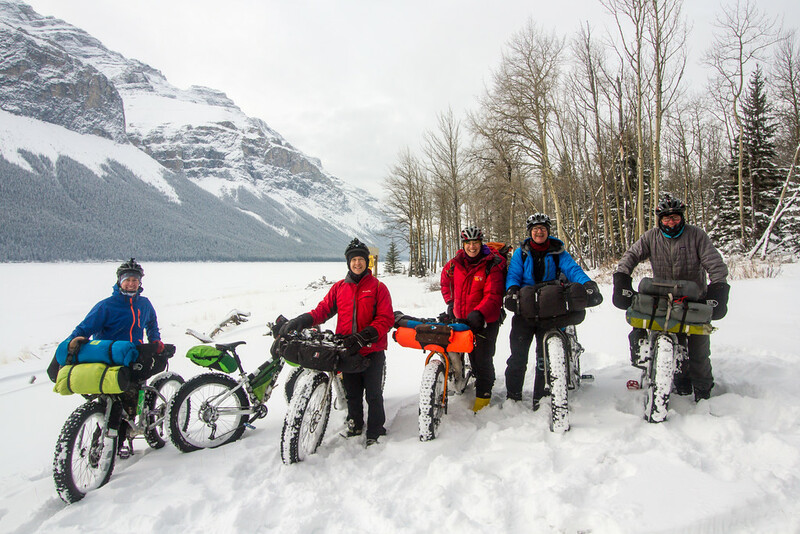 And then we were all back in Banff! And it was time to eat lots of food, and then have a lovely warm shower. Thanks crew – it was a great weekend! Previous PostElizabeth Parker hut trip (Day 3)Next PostIt’s yurterrific!